A minister’s daughter who became a teacher and housemistress for wealthy German families, Henriette Davidis wrote an important and influential cookbook that was essential for “Die Hausfrau” of the mid-nineteenth century. She later adapted her Old World dishes for German American immigrants who missed the foods of their homeland. Her recipes were translated into English and Dutch for hungry, ingredient-challenged settlers throughout the Midwest and Great Plains. If you read German, you can learn about her life and work at the website of the Henriette Davidis Museum in Wetter-Wengern. If you’re expanding your digital library of German classics, you can obtain a careful scan of her original book through the Projekt Gutenberg-DE. Fortunately for the rest of us, the University of Wisconsin reissued her American cookbook in an English-language paperback: Pickled Herring and Pumpkin Pie: A Nineteenth-Century Cookbook for German Immigrants to America. 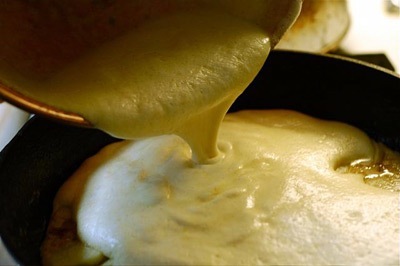 Pfannkuchen refers to a specialty of Southern Germany, not the similarly named doughnut of Berlin. 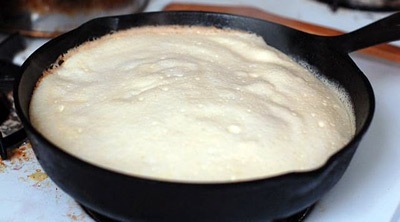 There are lots of recipes for German pancakes, also known as Dutch babies for the Pennsylvania Dutch cooks who helped popularize German food in the United States. I’m not sure how many Germans really eat giant, eggy pancakes for breakfast — we always had to chase down dense, dark bread and good cheese for our German visitors — but this dish is now entrenched in the culinary lore of American immigration and adaptation. I’ve seen versions that use beer and others that call for milk or water or both. Some require sliced apples tossed with cinnamon; others simply call for a sprinkle of sugar and a squeeze of lemon juice at the table. Some recipes recommend sturdy flour, while some have not a spoonful of the stuff. Many require the use of a hot oven; a few take the easier but less fluffy route on the stovetop. For those expecting the cakiness of an IHOP stack or the undulations of a sweetened Yorkshire pudding, you’ll be pleasantly surprised by this riff on Henriette Davidis’ recipe. As someone who grew up halfway between Wisconsin and Pennsylvania, I learned to love German-influenced dishes. My own version has zigged and zagged through all my family’s likes and dislikes. We settled on soufflé, not too sweet, cooked with fresh apples in the fall and topped with berry jam the rest of the year. Used to cakes bound with starches from corn, potato or water chestnut, I didn’t look askance at the flourless version. 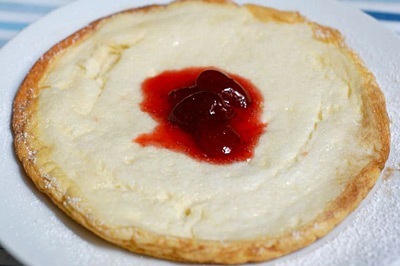 Below is my own immigrant pancake, by way of Henriette and Irma, Germany and Vietnam, Missouri and California. For a simpler yet equally delicious version, omit the apples and top with good quality strawberry or raspberry jam. 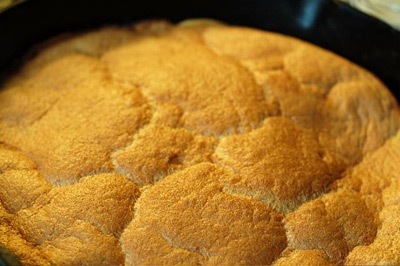 To obtain a more cake-like rather than custardy texture, fold in 1/2 cup sifted flour in place of the cornstarch. 1. Preheat oven to 400 degrees F, positioning the rack in the middle. 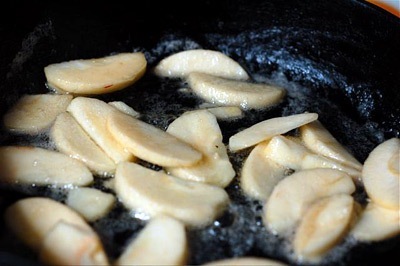 Toss the apple slices with lemon juice. 2. Beat egg whites to soft peaks. 3. Whisk together egg yolks, milk, cornstarch, sugar, salt and lemon zest. Gently fold in the egg whites. 4. Heat a large cast-iron skillet over medium heat. Melt butter, and as soon as the bubbles subside, add the apples. Arrange the apples in a single layer, and then pour in the batter. Cover partially and cook for 10 minutes. 5. Uncover and transfer the skillet to the oven. Bake for about 15 minutes, or until golden brown on the bottom and set in the middle. 6. Sprinkle with lemon juice and confectioners’ sugar, and serve immediately. The pancake may collapse, but it will still taste good. 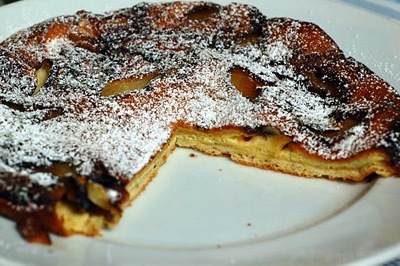 I LOVE IT WHEN MY GRANDFATHER MAKES GERMAN PANCAKES! THEY ARE THE BEST WITH POWDERED SUGAR! THEY ARE LIKE SOOOO TOTALY AWSOME! I CAN EAT THEM EVERY DAY!